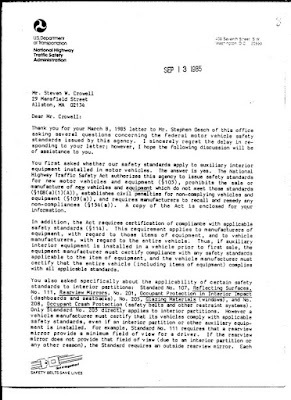 “During our many years designing and manufacturing police vehicle equipment, we have done much research to see if there was any federal regulation that might pertain to our products. Can this possibly be a sincere answer? It is possible that she believes this lie. The USDOT doesn't believe it. 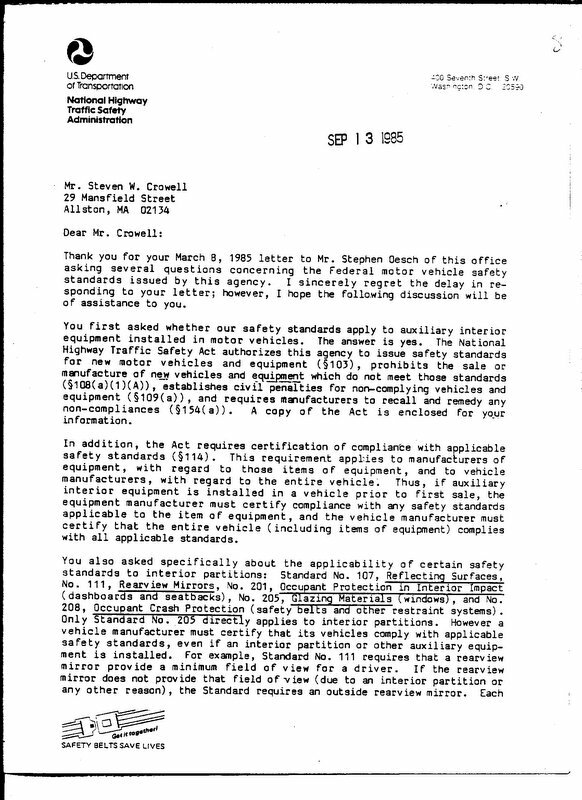 “You first asked whether our safety standards apply to auxiliary interior equipment installed in motor vehicles. The answer is yes. 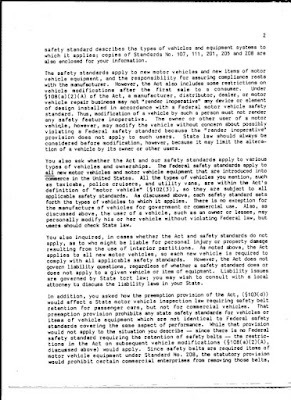 The NHTSA authorizes this agency to issue safety standards for new motor vehicles and equipment (S103), prohibits the sale or manufacture of new vehicles and equipment which do not meet those standards (S108(a)(1)(A)), establishes civil penalties for non-complying vehicles and equipment (S109(a)), and requires manufacturers to recall and remedy any non-compliances (S154(a)). 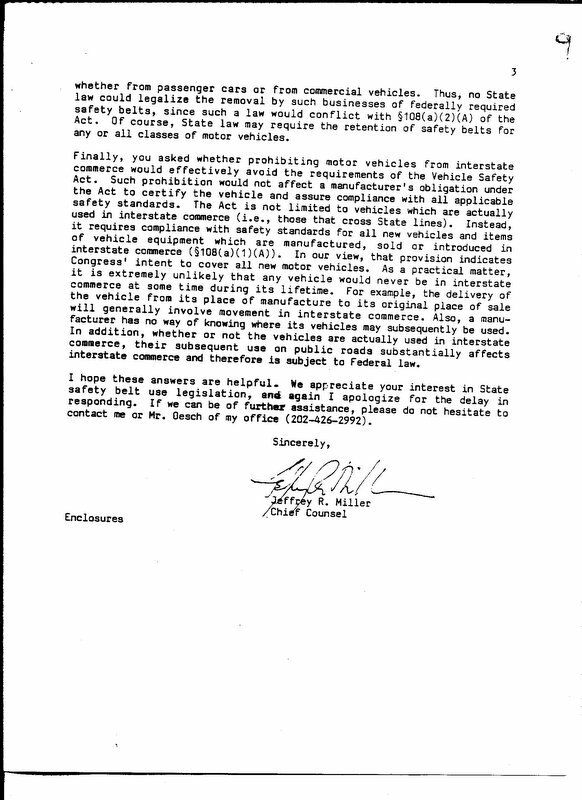 It seems pretty clear from this excerpt from a 1985USDOT letter. The law applies. I predict NYC will, since April of 2016, do as all other cities where partitions in taxis are optional, that is... decline to install them. Cabs without partitions installed have always been available in NYC. If you ever got one and asked why no partition, the answer would change over the years. At first, if the owner was also a driver, or if the driver worked for such an owner, the requirement was waived. Then it had to be driven ONLY by the owner for the requirement to be waived. The most notable thing about the TLC dropping the partition installation mandate is that this happens very shortly after Nissan's Taxi of Tomorrow was introduced, having the most evolved taxi partition design yet. Nissan surely regrets getting involved with the TLC and their illegal partition requirements. For a misleading article about the start date for NYC taxi partition mandate click here. Note that the TLC still requires, inspects and approves the introduction of sharp edges on the driver information display. The lie that the taxi partition mandate did not begin until 1994 is important. The mandate began in 1968. It has been in effect for 26 years longer than the TLC admits. "...passenger injuries may have come from taxi passengers' hitting their heads on the plastic partition between the front and back seats... made mandatory in most cabs beginning in 1994. 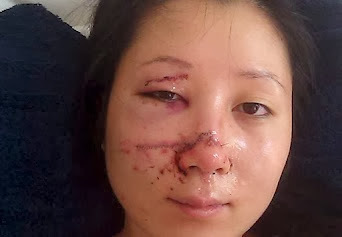 Aside from the fact that passengers in cabs are two and a half times more likely to suffer cranial or facial injuries than those in private cars being a disturbing fact, is the fallacy that the plastic partition between the front and back seats... was made mandatory in most cabs beginning in 1994. The requirement began many years earlier. This is not a benign lie. “Detroit needs three to four years to make really major changes and we had to work within this limit” Mr. Mautner said. 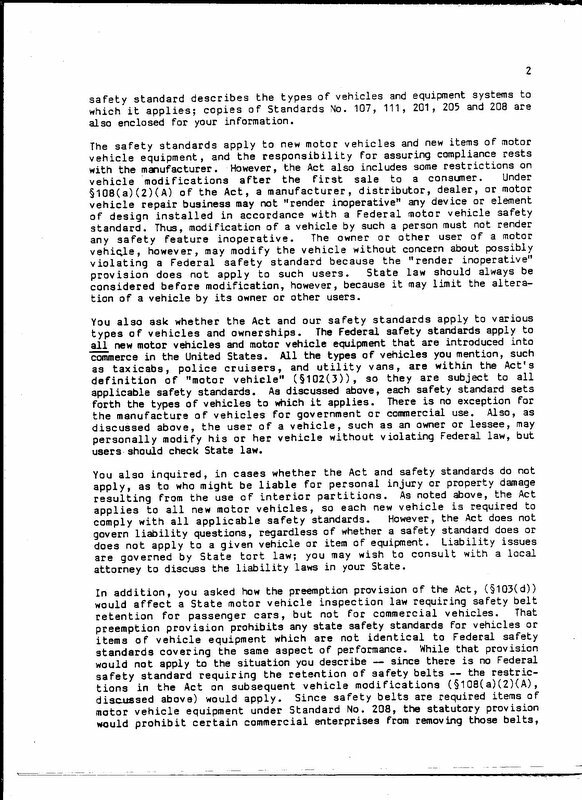 “But this is a start and we have put Detroit on notice that we will be doing more… Stephen Wjlder, a Taxi Commission engineer who supervised preparation of the standards; said the agency had been discussing the evolving plan with the four major suppliers of city taxis - the Chrysler Corporation, Ford Motor Company, General Motors and Checker Motors - for several months, all were working to meet the standards.” The cab regulators in New York must have appeared fairly 'full of themselves' to the big four. The NYC TLC cab partition standard is convoluted and has a history of evolution in its' specifications. 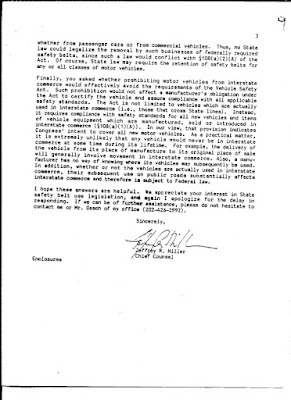 They have yet to require the partition to be certified to be compliant with federal standards despite many pleas from this complying manufacturer to do so. Cab partitions are portrayed as friendly barriers that are there to keep unruly gun wielding assailants from hurting the driver. The actual truth is cabs are required to have partitions installed in order to create The illusion that the issue of cab driver murders has been addressed when it has not been. They do this with total disregard for passenger safety in collisions and driver safety in assaults. B) precludes preemptory or retaliatory action on the part of the driver. Without a partition most robberies are done with a knife or an implied weapon and the driver can usually reach the assailant. Without a partition it is like 'two dogs in a cage'. With a partition it is more like 'shooting a fish in a barrel'. Now, these predictable outcomes are coming home to kill our loved ones who happen to be in a taxi in any one of a dozen-odd cities in the US that require partitions.